Often minor repairs in the kitchen or in the bathroom to do yourself. For example, if you suddenly started to leak the faucet. In this case, the mixerwill likely have to remove and put a new gasket. To disassemble the faucet is not as difficult as it seems. You only need to know a few technical subtleties. First of all, you need to "soak" threaded connections, which are contained in tap water salts and other substances like "stuck" to each other. To do this, use automotive lubricant WD-40, and if you buy it is not managed - kerosene or vinegar. Thoroughly moisten the connection with thread softening means, wait for 10 or 15 minutes. Now you can gently remove part of the mixer. Using a thin screwdriver to remove the plugs; if they are metal, they'll need to Unscrew with pliers. Phillips screwdriver remove the handles of the faucets, then remove the handle yourself. After that comes the most difficult moment you come to Crans-to-date. To remove them, as a rule, difficult. They can be "attached" stronger than all. If the first attempt to remove the crane bushing failed dampen their lubricating impregnated again and again hold 10 min. Remove the crane bushing wrench. If you can't remove them, leave until the last moment, when the mixer as a whole will already be cleared. Be very careful not to damage the finish, loosen with a wrench the spout of the mixer. Use a soft cloth to prevent direct contact of the key with nut spout. Most often water leaks occur in the joint of the spout and the body of the mixer. Check the condition of gaskets (shims) in this place. If necessary replace the gasket. As carefully using a soft cloth, remove the mesh. Check the condition of the mesh – maybe that needs to be replaced, and the rubber gasket. Disconnect the housing of the mixer from the sink. Not an easy job, since the nut is usually "a strong liking" to the bolt, and in addition, the bracket itself is in a very uncomfortable place. Then you may need an assistant who will hold the mixerwhile you remove it. Loosen the nut of the faucet key "11". Then remove the metal plate and gasket mounting. Check their integrity. 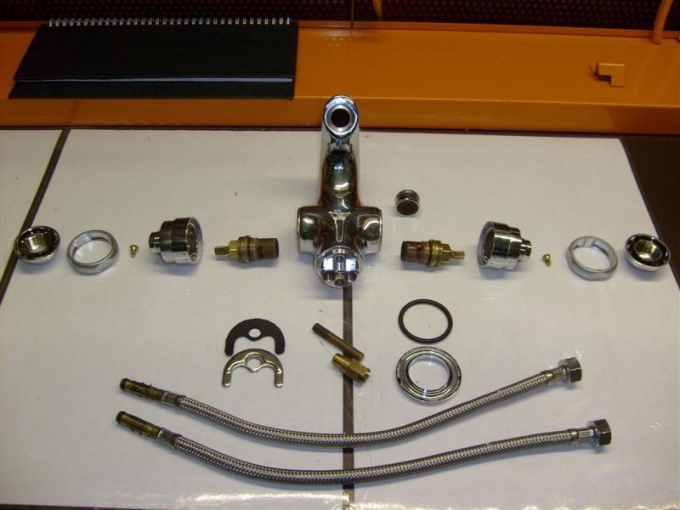 Slightly pull the body of the faucet, and Unscrew the water hoses, if they are flexible. If mounting faucet to the water supply is hard, you will again have to Unscrew it in an awkward position. Undo the hoses on the key "10". After you have disassembled the mixer, you will be able to pinpoint the cause of leaks or other problems, replace the old parts and reassemble the faucet.